You want Thanksgiving dinner, but you don't want to cook and you don't want to go to a restaurant. That leaves you with one choice: Get it to go. Steakhouse has whole turkey with gravy for up to 11 people, $99. Organic free-range turkey with gravy is $190. Family-style sides include garlic smashed potatoes, lobster risotto, creamed spinach, and cranberry sauce. Desserts include cheesecake, coconut cream pie, and pumpkin pie. Place orders by November 19. Pick up November 21 11 am–6 pm. Oak Lawn 214-209-2201, North Dallas 972-239-3400. Downtown Dallas restaurant has 9-inch pumpkin and pecan pies for $30. Order by November 17; a select number will be available for purchase on November 21. Pickup November 20-21 from 7:30 am-10 pm. 972-698-4250 or info@bullionrestaurant.com. European market has ham, turkey breast, and turkey leg, $26-$29. Sides are $16-$22 and serve up to 6, including mashed sweet potato, Brussels sprouts, broccoli rice casserole, green beans, macaroni and cheese, Gruyere spinach gratin, sausage stuffing, cornbread stuffing, and more. Desserts include pumpkin swirl cheesecake and pies including sweet potato chocolate chess, pecan, apple, and pumpkin, serves 6-10, $17-38. Order by November 20, pick up November 21. Dallas bakery dedicated to using the highest quality ingredients has pies and baked goods. Pies are $20-$23 and include apple cranberry, pecan, and pumpkin. Breads include cranberry walnut, cranberry paisano, pumpkin, and gingerbread, $7-$12.50. Rolls include challah, soft paisano, molasses wheat, and sweet potato, $6-$6.50 per dozen. Pick up by November 19. Turkey to go menu includes field greens salad, brined turkey, green bean casserole, sweet potato gratin, buttermilk mashed potatoes with chives, cornbread stuffing, cranberry orange compote, rolls, cornbread, and choice of two desserts from bourbon pecan pie, apple-cranberry crumble, pumpkin pie, and jumbo chocolate. Order by November 20. Pick-up from 12–5 pm November 21 or 8 am–noon November 22. $140 for 4, or $265 for 8. 214-720-5330 or email lisa.moore2@fairmont.com. Pecan pie is a twist on the beloved southern pecan pie with a crispy cinnamon roll crust and served with caramel sauce. Must be ordered 48 hours in advance. Available November 12- December 24. $40. The Ranch at Las Colinas 972-506-7262, or Haywire 972-781-9473. Lakewood Southern restaurant has holiday sides for pre-order and pick up through December 23. 972-685-6753 or email kitchentexas@gmail.com. Special carry-out turkey dinner serves up to 10, with turkey, rolls, salad, choice of 4 sides from cornbread stuffing, cranberry sauce, whipped potatoes, green bean casserole, glazed sweet potatoes, spinach Gruyere au gratin, baked mac and cheese; and choice of pumpkin or apple pie. Sides are also available a la carte in small (serves 5) and large (serves 10). Order by November 19; pick up November 20-21. www.marie-gabrielle.com/mgthanksgiving. 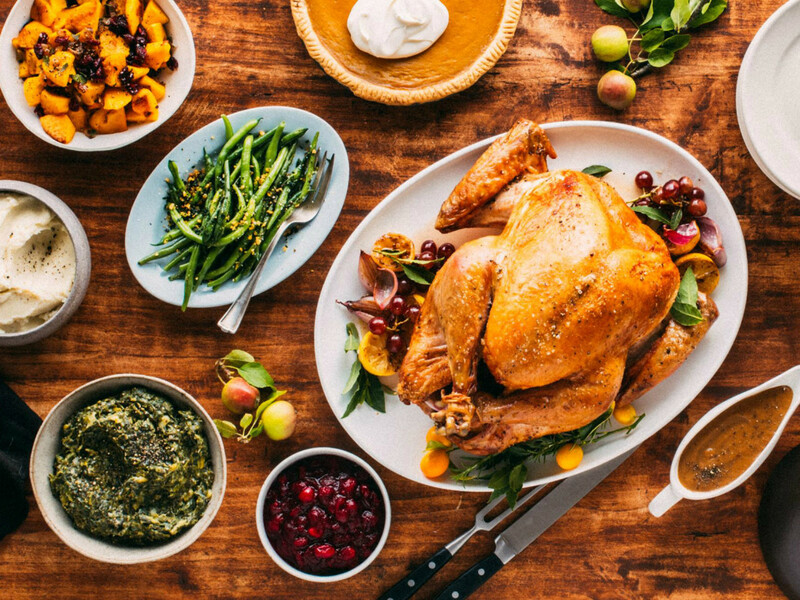 Traditional holiday meal serves 8-10 with turkey, cornbread stuffing, candied-pecan mashed sweet potatoes, mashed potatoes, green bean casserole, apple cranberry orange relish, gravy, two carrot nut loaves, a whole pumpkin pie, and a whole pecan pie. $105. Just the sides include everything but the turkey and dessert. $50. A brunch menu features croissants or muffins, mixed fruit, and single-serving Lorraine or Florentine quiches. $42 for 7 or $84 for 12. Pumpkin and pecan pies are $17-$18. Must order 24 hours ahead. www.mimiscafe.com. Family holiday meal includes smoked turkey, cornbread dressing, green beans, mashed potatoes, rolls, and cranberry sauce. Served 8-10 people, $100. Holiday catering menu includes smoked turkey, boneless smoked turkey, smoked ham, spiral sliced ham, brisket, and pulled pork. $13-$15 per person. Buttermilk or pecan pies are $15. Available at all 21 locations. For ordering info, go to www.soulmans.com. Holiday pies in pumpkin, apple crumble, and pecan are available in 6- or 9-inch versions. Baked goods include pumpkin cupcakes with cream cheese frosting; cranberry orange cake three-layer cake; and frosted sugar cookies in a turkey or pumpkin pie slice shape. Must order by November 18. Pick up on November 21. Richardson barbecue spot has brisket, turkey breast, spiral ham, and pork, serving 6 to 15, depending on selection, with prices ranging from $18 per pound to $145 for a whole beef tenderloin. Sides including brisket beans, five-cheese mac, green beans, potato salad, slaw, and cornbread stuffing, are available in half pans serving 15-20 people. for $42. Peach cobbler, banana pudding, and chocolate or Key lime pie, $40-$55. Must order 48 hours in advance. Available through December 24.